Everyone has that shady spot that they want to get to looking good, but sometimes it is hard to figure out just exactly what to plant in these locations. It could be a spot on the north side of a wall, an area under a tree, or a space that is just to the edge of a wooded canopy. Regardless all of these would fall into the shade loving plants category. So, let’s take a look at 12 different popular options – that work for Zones 4-8. 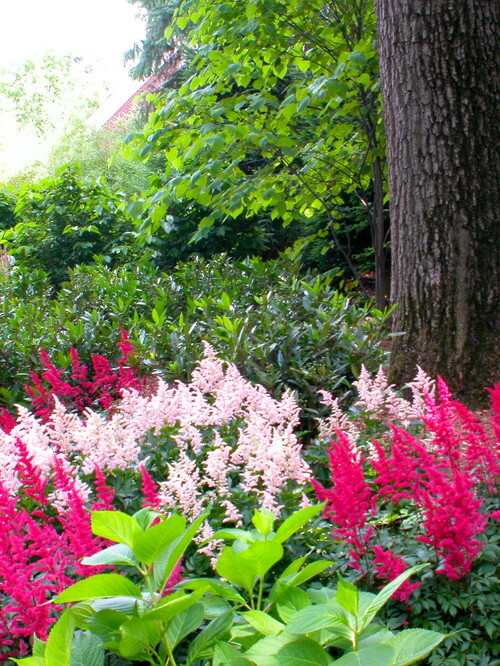 To begin with, let’s start with the perennial shade loving plants. Just a FYI for the true beginners: Perennials are plants that die off after their season has passed, but come back each year on their own. 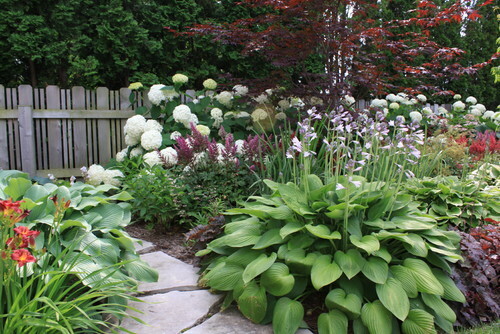 When I think of shade loving plants, my mind automatically jumps to Hostas first. Why? Well, they are so very easy to grow. They get bigger and more beautiful each year. They come in a variety of green and almost blue tones. They last from spring all the way through Fall. They can brighten an otherwise dark area, or provide a solid green background to contrast against other show stopping plants. After 3-4 years, they can be divided to produce even more plants. And finally, they produce a flower stalk during the Fall season when most everything else has finished blooming. These are best in partial to full shade. Generally speaking, the darker the plant the more shade that they will take. For best results, allow no more than 4 hours of early morning sun. Filtered light is even better – depending on how hot your summers get. 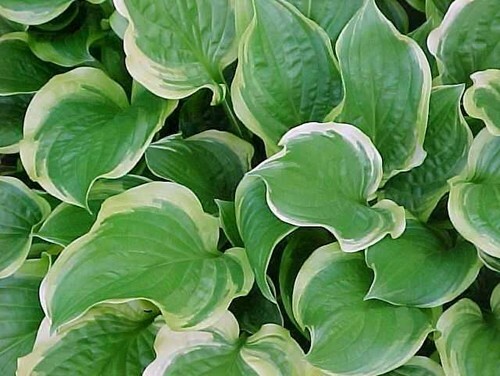 In the Southern states, Hosta’s leaves will scorch in too much afternoon sun. Astilbles are famous for their tall floral plumes. They come in a variety of colors and can work in partial to full shade depending on the variety and your location. They are considered an easy plant to grow and require little maintenance. 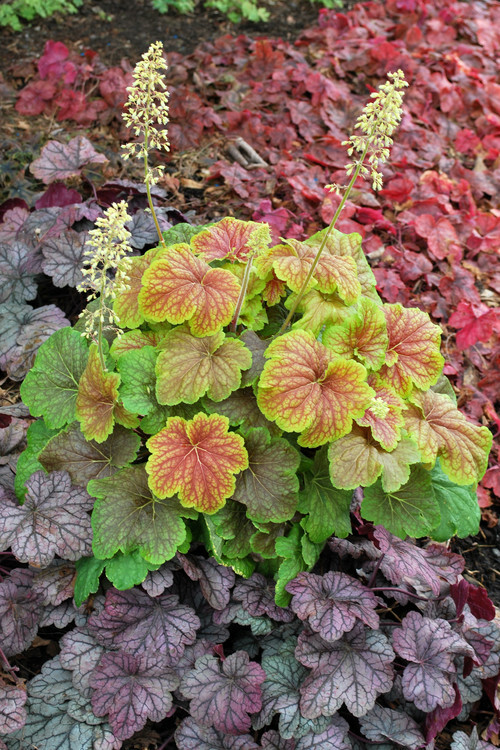 Heurchera (sometimes referred to as coral bells) are another classic from the list shade loving plants. You will find that some varieties are labeled for part to full sun, but in general, many of these are considered shade plants – again, take into consideration your location. (i.e the further north that you travel, the more sun that you will be able to get away with and still have good results). They come in a wide variety of colors. Although you may be able to get away with sticking these in the sun, provide these with partial shade or filtered shade for best results. They work great at the front edge of a bed. 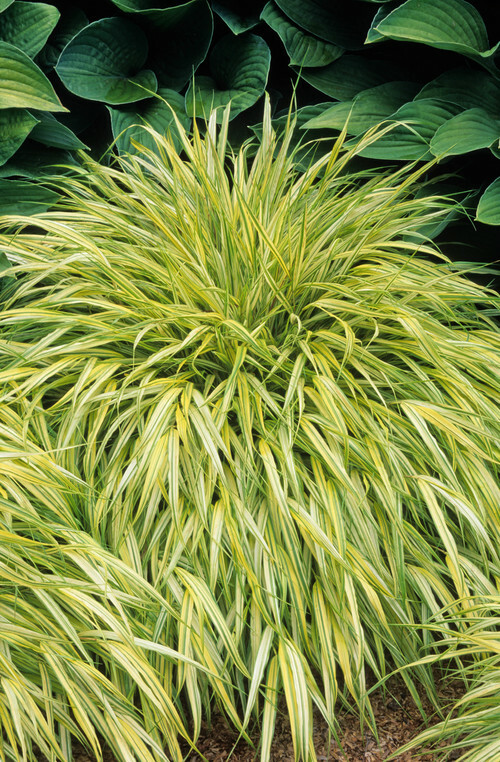 Japanese forest grass is a great way to lighten up a shade garden. I love these as little splashes of light scattered throughout a bed, or even as groupings for a big impact. This is one plant that can take full shade. In fact, sun tends to scorch the blades and turn them an ugly brown. Ferns are another great perennial for shade gardens. This particular variety (above) is an ostrich fern, but there are so many other choices. 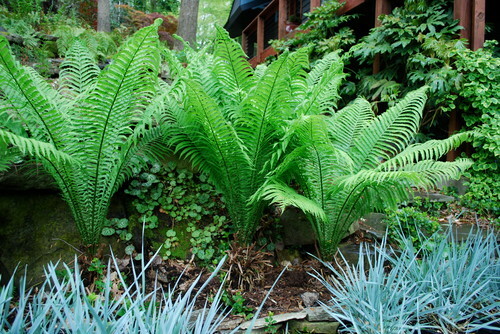 Although different ferns require differing amounts of sun, most – like this one above – prefers full shade. If shrubs are what you prefer in your garden, check out these options for a range of partial to full shade. 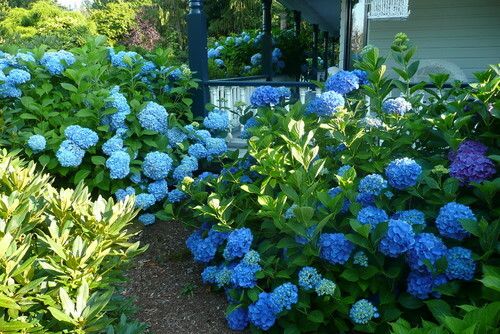 Hydrangeas come in various sizes, colors and shapes. The easiest way to distinguish a sun loving hydrangea from one that would do better in some shade is to look at the shape. 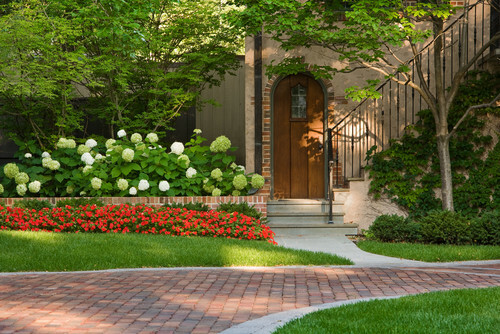 Although it is not all inclusive and may be dependent on your location, for the most part the panicle hydrangeas should be avoided for shade gardens. They tend to like some sun. So, let’s stick to the more rounded ball shapes. What is so great about hydrangeas is that you can get white, pink, blue, or purple blooms, and any shade in between. They also pack a visual punch to any bed. 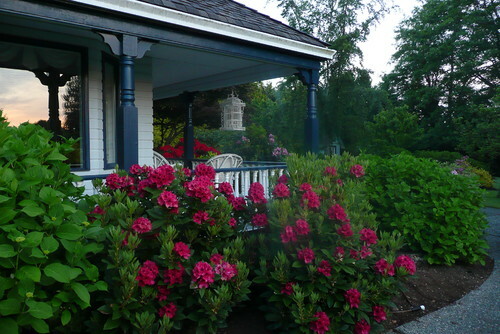 Rhododendron – The fussier sister of the azalea plant. In hotter climates (zones 7 or higher) these need to be sheltered from the hot afternoon sun. However, in cold climates (zones 4-5 and sometimes 6) these really need at least 6 hrs of sun each day. But, when you can get these to work, they are quite spectacular. 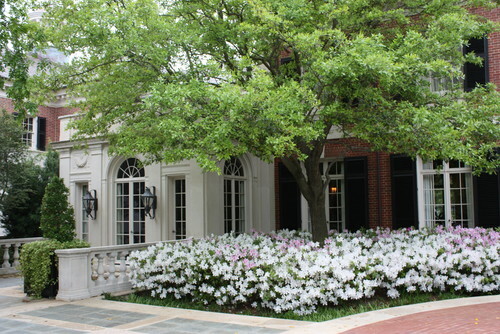 Azaleas are a bit easier to deal with and come in many, many varieties, sizes and colors. You are bound to be able to find one that will take partial shade for your area. They are a staple shrub down here in the south, and as you can see, they are beautiful when in bloom. 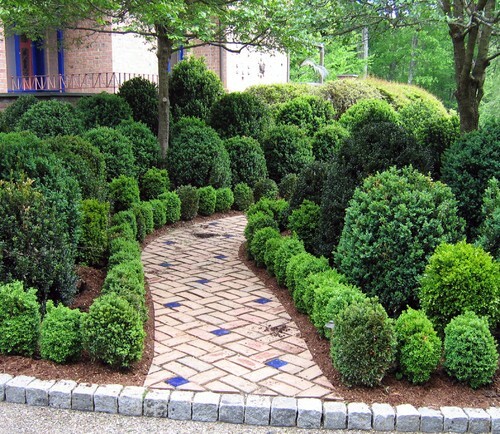 If you have never considered having an evergreen shrub in a shade garden, I am here to tell you that it is possible. 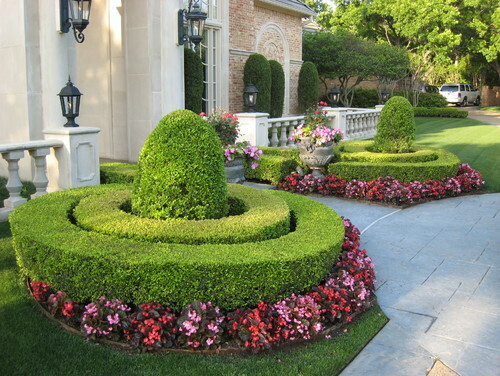 The ever popular boxwood has many varieties that can take partial shade areas. Although, the labels quite frequently state partial to full sun, do not be fooled by them. I have potted green velvet boxwoods against the north side wall of my garage. They only get a few hours of early morning sun (from 7am-10am during the summer, a bit less during winter). The rest of the day they are completely shaded, and they have been doing very well for the past 3 years, since I planted them. They do best with at least a few hours of sun, otherwise they will get leggy. In hotter zones, they prefer at least some protection from the hot summer sun. So, depending on how far north you are located, adjust the sun exposure accordingly. But, don’t be afraid to add these to a partially shaded area. Annual are just as the name implies. Here for a year and then gone – unless, of course, you replant next year. Impatients are a great choice for an annual in a shade garden. They come in many different colors and can require differing amounts of sun. I have found them to do best with indirect light and/or dappled sun. Caladiums are great for their colorful foliage. They provide summer time color when all of the spring blooms are long gone. Consider these for your shade garden as a way to have colorful interest during the non blooming months. Begonias are a favorite of mine in the annual department. They do best in filtered sun, and look great as an edging. They come in varying shades of pinks and reds, and a few newer varieties expand those color choices. They also provide summertime blooms that continue into the Fall. These are just a small sampling of the options that are available for shade gardens. It’s not meant to be all inclusive, so shop around if you want more than you see here. 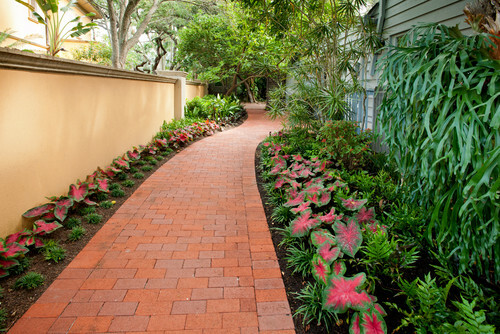 Shade can provide a great place to create a beautiful garden. There is nothing that says that you must have full sun to attain beauty. So, go for it!